The Siamese fighting fish is very popular among fish keepers due to its unusual coloring and interesting behavior. Usually, beginners tend to listen to what seller says – that the fish requires a tiny tank, no water heating is needed and in general betta fish is not demanding as for its keeping. However, there is very little truth in these words and the fish requires completely different care. Unfortunately, freshwater fishes are not that good looking as the seawater ones. Siamese fighting fish is considered as one of the most colorful inhabitants of tropical fish tanks. To evaluate its beauty to the full extent you should create proper tank conditions for the fish, otherwise all you will get is disappointment and lost of interest to betta fish, which they definitely don’t deserve. There are quite a lot of articles about Siamese fighting fish, since they are one of the most popular tank fish. Of course, we have a complete article about it on our site. Here is the link. However, in this article I’ll tell you how to choose a tank for betta fish. It will be of special use for beginners, who want to have exactly this fish in a tank. Though, there is nothing difficult in choosing a tank, but since the product is a popular one, it won’t be easy to make the best choice. I must warn you right away, that unfortunately betta fish doesn’t live long in a tank. If the fighting fish is 2 years old, it’s considered as a senior age. Fishes not older than 12 months are used for breeding. That’s why, here’s rule number 1 – buy a young fish. It may not have gorgeous fins (this will change), but it’ll easily adapt to new tank conditions, it’s active and it’ll live longer. Rule number 2 – betta fish should live alone. This is due to many reasons, but the main one is its behavior in a tank. 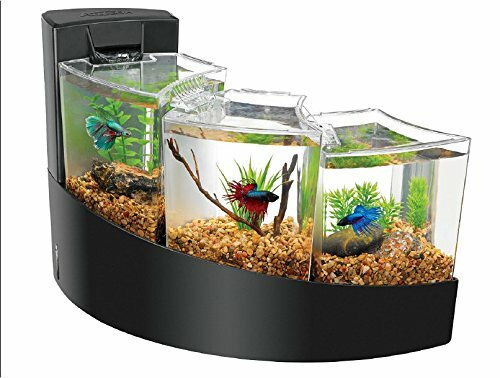 3 What tanks are good for betta fish? 5 How to set up an aquarium properly? 6.7 Hagen Fluval Spec III – Perfect for a beta! 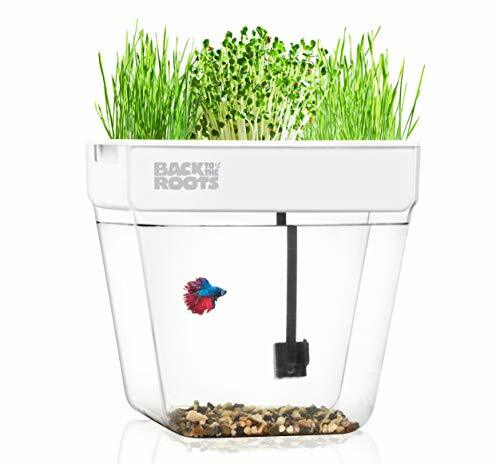 6.10 Back to the Roots Water Garden – its aquaponics, but…. It’s desirable to keep the fish alone in a tank or it should have small or average sized, very peaceful tank mates. You may encounter information, that this fish is an aggressive one and it can even kill other fishes. This isn’t true! Betta fish gets along well with other fishes and only sometimes they may nip long fins of their tank mates. Though completing with each other is quite an ordinary and natural thing for them. Besides it happens only between the male fish, but sometimes it can be observed between the females as well. Do you remember another name for betta fish – it is Siamese fighting fish. Therefore, male fish can’t stand each other and fight till one of them gives up. In small sized tanks with small number of fishes fights between betta fish males may even end up with death of the weakest fish. For this reason it’s recommended to keep just one male or a male and several females in small tanks. Still, I’d advise keeping just one betta fish. Why? When the male fish is alone, he has no one else to fight with. When there is a couple in a tank, the male fish continuously haunts the female stimulating spawning. I’ve had a situation, when the female fish was hiding all the time, since the tank was small and in the end she died because of stress. Quite often you may hear that betta fish don’t swim in tanks, they just rest on a tank bottom or plants. Yes, this happens quite often, but in tanks where there is also larger or more aggressive fish or if tank water temperature is low and if betta fish is rather old. The higher the temperature is, the more active is the fish and it is also less prone to various diseases. Betta fish doesn’t like when temperature gets low or changes abruptly. If this happens, the fish gets ill and dies very fast. Tank with betta fish should be thick planted with different plants and the water has to be clean and fresh. The fish is less active in old water and it is more prone to illnesses. What tanks are good for betta fish? Sometimes you may see betta fish sold in small plastic bags or in tiny jars. In Asia it occurs especially often. Well, this happens because this way the seller can put more fishes on the same square and the fishes are seen better. However, surely the fish can’t live in a glass or a jar with water. Betta fish size is 2 inches(5-6 cm) in average, that’s why they still require some space to swim freely. But the fish is not ascetic, therefore it will get the best conditions in a special tank for betta fish. You will enjoy observing the fish through an artificial bowl and the fish will get used to it fast and even may have some offspring there. In general, I opt for a big tank for betta fish and the bigger, the better. Not least because it’s easier to keep biotic balance in it, the fish feels more comfortable and the tank looks better. However, I’ve seen betta fish kept pretty well in smaller volumes. Below I’ll list several options of the tanks you can take into consideration and then demonstrate them using tanks sold on Amazon.com as example. A rectangular shaped tank of 2.6 US gallons (10 liters) capacity may look too plain, but yet it suits the fish better than a glass jar. 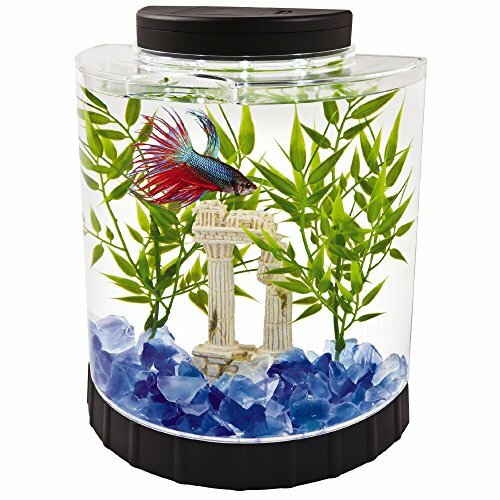 Siamese fighting fish can swim freely in it, enjoy tank decorations and in such a volume you can keep water parameters stable. The tank won’t get too hot and it’ll maintain stable biotic balance. A rectangular shaped tank of 5.2 US gallons (20 liters) capacity – if you yet don’t have the ability to buy 20 liters tank, take a bit smaller one. This tank is of a minimum capacity acceptable to keep one adult betta fish. However, it is much harder to maintain biotic balance here. The tank will get dirty and heat very fast. Round shaped tank for a betta fish – there is an anecdotal evidence, that betta fish die in such tanks, although this is not quite true. It is good to use such tanks to keep the fish in quarantine till it gets used to new environment. Round tanks will do as a convenient bowl to transport the fish. You can even put some small decorations and a filter into it. But, it is difficult to clean such a tank – ordinary scraper won’t clean the algae from the glass as well as a brush. It is considered that tanks of such shape harm the fish sight, since they distort its appearance from optical point of view. Of course, you can choose round shaped tank, though rectangular ones are better and easier to clean. Bottom substrate in this case is just a decoration, but at that is reduces the amount of water in the tank, which means that less space is left for the fish to swim. I prefer to do without the substrate just because it’s easier to clean the tank without it. If you want to have the bottom substrate in your tank, put a very little amount of it and not very bright colored. I like dark substrate, black, for example. If you are dreaming to see your betta fish in a tank with bright multi-colored bottom, think twice – the bright fish won’t look as good as it could on such a background. Though, if the substrate is black, the fish coloring will be shining like a star. It’ll be a good idea to buy a heater. There very small ones on sale. You can install it on the back glass of the tank. Thermometer will be also needed in case if the heater breaks and heats the water too much. It’s better to keep water temperature stable in betta fish tank, since such small water volume is prone to rapid change of temperature. As for an air pump – you don’t need it, since betta fish is from climbing perches (Anabantidae) family and it breathes with atmospheric air taking it from the water surface. In my opinion, water filter will also be a needless device in a small tank and with only one fish in it. How to set up an aquarium properly? So, you have bought all the above mentioned stuff, brought it home, washed the tank with clean water, put it where you’d like it to be (don’t put the tank close to the window, because algae will grow very fast on tank walls), you washed the substrate and put it on the tank bottom, planted tank plants and turned on the heater. Now you have to wait for a week and then you can go and get your betta fish. Adult betta fish should live alone in the tank! And don’t forget to buy food for your new pet! After you brought your fish home (keep in mind, that if it’s cold you should carry the fish under your coat, for example, so it won’t get cold). Now put the bag with the fish into the tank, in 30 minutes renew half of the water in the bag with the tank water. After another 30 min you can put the fish into the tank. You can feed it 2-3 hours later. It’s not difficult to take care after such tank, if you stick to the feeding rules. You should every day wipe the glass with a sponge, siphonage the substrate (you can find small siphons on sale). At that you have to renew 1/3 of tank water with fresh one, that has been settled for 2-3 days. And the last thing – if it seems to you that the fish is getting bored alone, first of all – you are wrong, since in the wild they also don’t live in schools! If you put some snails or shrimps in the tank, the fish will eat them (though, you can try to put Amano shrimp as betta fish tank mate). Also you can try to put several pigmy cory, harlequin rasbora, white cloud mountain minnow into the tank with betta fish. But remember, that in this case the tank volume must be larger! Further I’ll be reviewing 10 most popular betta fish tanks. Please, keep in mind, that my opinion may differ from other points of view. I adhere to classical tanks (large volume, live tank plants, quality lighting), but I do understand that not everyone can afford it for many various reasons. What I’m trying to do, is to give my opinion about one or another tank, indicating its advantages and disadvantages. And of course, it is up to you what tank to choose. Also for convenience I’ve created a table with the most important tank characteristics (there are not so many of them). 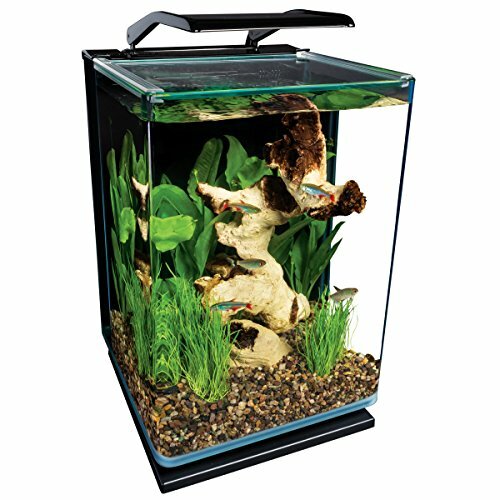 16.99" L x 4.92" W x 11.15"
This is one of the most popular tanks for betta fish on Amazon.com, almost the best-selling one. As for its advantages, I should mention its half-moon shape, which makes it very convenient to put it near the wall and it’ll look perfect. Another plus is an embedded cover with a LED lamp. The tank capacity is 1.1 gallons isn’t the largest one, but it’s quite enough to keep the fish successfully. As for the drawback of this tank – it is inconvenient in routine maintenance, has no power cord in its set and the most important it is made from plastic. This material is easily scratched and taking into account its shape, scratches will inevitably appear. This is one of the most interesting tanks with the worst execution though. I must admit, that the idea was brilliant – provide three tanks instead of one, which are connected into one system with a waterfall. Also it has an embedded filter. However, it’s not that simple in the real life. If you have just one fish, the other tanks will stay empty. It’s difficult to heat all three tanks equally, so you’ll need three heaters for each of them. The volume of each separate tank is not enough to keep one betta fish in comfortable conditions. 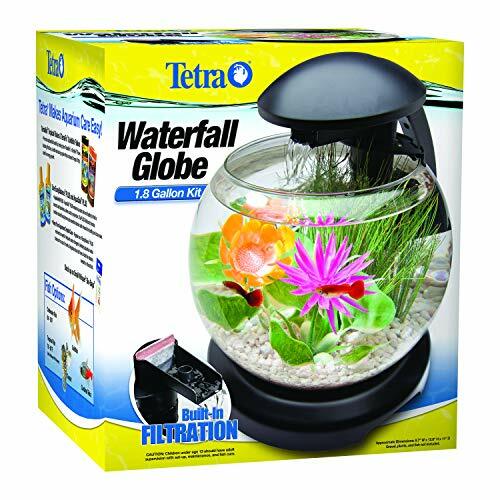 The water flow rate is excessive and considering the fact that betta fish in not very active, this leads to the fish death. The filter contains sintepon inside which gets clogged very fast and you’ll have to buy expendables. In general, this tank may be more interesting for those, who want to keep several fishes at once, but don’t want to overpay for buying three tanks. I’m familiar with MarineLand company as with a manufacturer of quality external filters. Yet, they produce quite a lot of things, including aquarium kits. And I like MarineLand Portrait Glass a lot. See for yourself, the tank has an embedded LED lighting, which is not a simple one – it has three different colors. For example, at night you can turn on blue light. It will not disturb you and help to fall asleep easily. The tank has a convenient shifting cover and embedded water filter which really works. Not to mention tank’s convenient shape and proper capacity – 5 gallons. 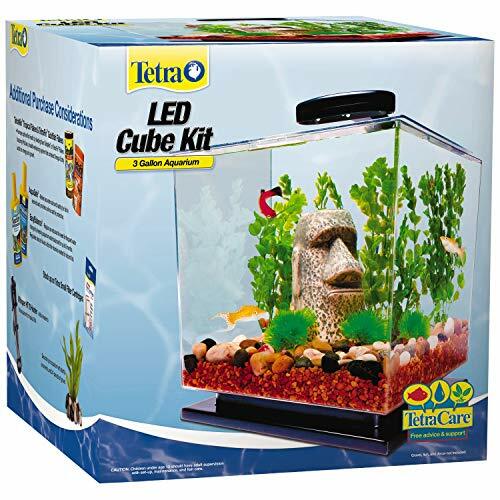 This tank is an excellent choice to keep most of small tank fishes and it will do for betta fish as well. I agree, its price is higher than that of other tanks, but here you pay for the quality, convenience and good design. Advanced 3-stage hidden back panel filtration with adjustable flow filter pump. This is a classical round shaped tank, but with some modern features like waterfall, for example. In general, German company Tetra has been manufacturing quality devices for aquariums for a long time. 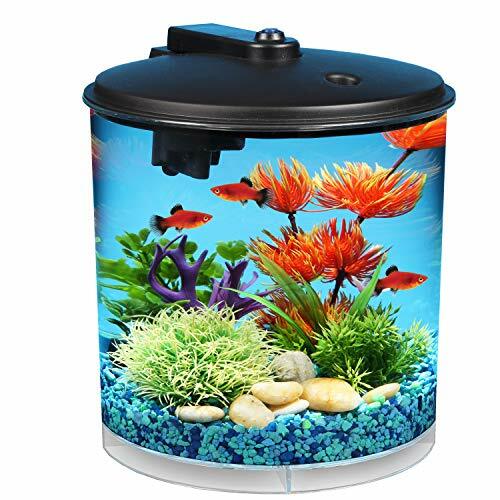 This tank is worth its money and it is good for betta fish, but I wouldn’t get it just for one reason – it is round shaped. Have you ever had a round tank? I have. It’s impossible to wash it. And you’ll have to do it, because algae grows fast on its walls. And you come to the question – how to remove this algae? I had only one option – a sponge. I successfully washed the tank, but I scratched the glass. Another thing is, that this tank distorts the view of how fish and plants look due to its shape. The name of the company says nothing to me and suspect that is a true China product. Correct me, if I’m wrong. I don’t mid though, they can do some quality products. However, there is nothing I can say about it’s advantages either, I have no experience with this tank. All I know is, that it has the same problem as the previous one – the shape isn’t convenient for washing and it is made of plastic instead of glass. Which means that it is easily scratched. As for its advantages – it has embedded illumination with various 7 colors and a timer, powerful internal power filter and it is qualitatively assembled. Fluval company is classics of aquarium husbandry. It is like Mercedes – the time-proven quality. 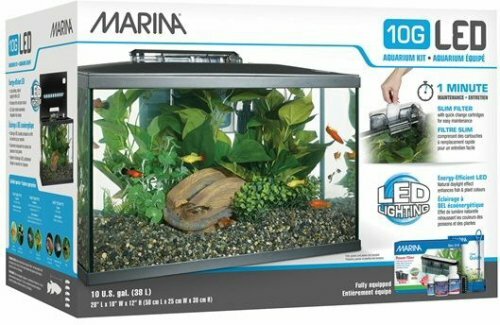 In this case the aquarium kit is too much high-end for betta fish, but I’ve included it to the best tanks list. Stylish design and easy maintenance make Spec tank a decoration of any office or house. Matted glass hides the filter that keeps the tanks clean and makes the water good for your fish health. The tank has LED illumination that consists of 31 powerful LED lamps, which perfectly light the tank, add colors to its inhabitants and plants and allow to keep live plants. Hagen Fluval Spec aquarium has powerful recirculating pump with an adjustable output, 3 stages filtration system that provide more than efficient filtration to keep tank water clean and transparent. The set has all necessary components for filtration: mechanical filtration, biologicalone (BioMax rings), chemical filtration (absorbent carbon). This is the only tank in the list equipped with such a filter. Of course, we should mention its capacity – it’s enough to keep not only one small fish. I fancy the tank a lot, but the price is rather high. Hagen Fluval Spec III – Perfect for a beta! This tank is of smaller capacity, as for the rest it is like the previous model. The tank has a stylish design and will perfectly fit any interior. It looks especially nice on a work table. LED illumination provides excellent lighting for the tank, makes tank inhabitants colors more bright and pronounced as well as tank plants and decorations. Due to this illumination the tank can be used to keep live plants. There are two lighting modes – bright daylight and blue for night time. The tank feature is that it uses matted glass to hide the water filter. The filter is installed on the back wall of the aquarium. Three staged filtration system provides quality cleaning of the tank water. Mechanical filtration ensures rough purification of water from coarse particles of dirt. Coal filler is for chemical purification – it absorbs organic wastes, dyes, drags. BIOMAX filler is for biological purification and it ensures useful bacteria growth as well as optimal biotic balance in the aquarium. The pump is located in the filter bottom, water intake is performed through the upper aperture. 2.6 gallon Nano aquarium and Powerful 3-stage oversized mechanical, chemical and biological filtration. This is another quality tank made by Tetra company. It has classical shape, LED illumination, an embedded water filter (hidden behind the decorations) and a stand. It’s roomy but not too big. The look is modern and stylish. Unfortunately, it is made of plastic, which again means that it easily gets scratched. As well as there are some issues with assemble quality. 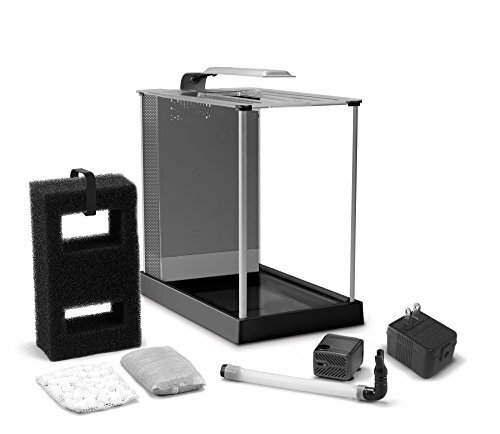 Equipped with a Tetra 3i filter to keep your tank clean and provide a perfect environment for small tropical fish. Perfect for small tropical fish, goldfish or betta. This is quite an attractive option for beginners, since the kit includes all that is required to set up a tank. 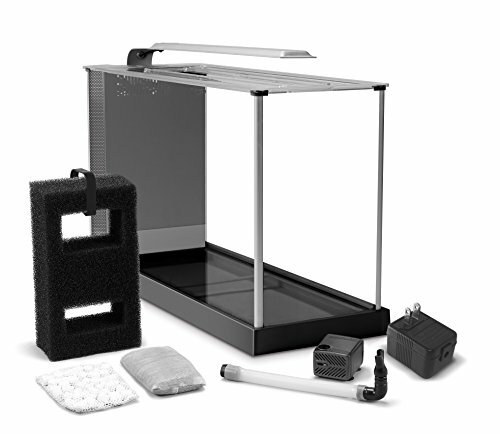 Namely: the tank itself (with three options for capacity), a cover with LED lights inside, a filter, fish food, a net, fluval aqua plus water conditioner, fluval cycle biological supplement to create a biologically balanced environment and a manual with explanations. The smallest tank capacity of 5 US gallons is enough to keep betta fish successfully and the classical shape of the tank doesn’t distort the image and looks very appealing. Back to the Roots Water Garden – its aquaponics, but…. It was not easy to choose the best tanks, but I did my best. And I’d like to finish my review with not the best option of the tank to buy. Why do I think so? Well, let’s take a look at Back to the Roots Water Garden. The idea was adopted from the large tanks. Nowadays, it’s getting popular to create a live filter above the tank – a volume in which there are marsh plants and other plants that can grow in flooded areas. Water comes from the tank into this volume after passing through the substrate it is getting filtered and the marsh plants absorb nitrates from it. But the problem is, that what works for large tanks doesn’t work for small ones. The water flow in this tank is insufficient for such way of filtration and it’s more difficult to maintain this system. It’s more complicated than a standard classical tank. Another thing is, that the tank capacity is small even for betta fish and one more drawback is its shape. Thus, in general the product is ok, but as for me, who favors everything natural and ideally perfect – I don’t like it.